Atrial fibrillation (AF) is the most common type of abnormal heart rhythm. AF is an irregular, frequently rapid heart rhythm caused by many disorganized electrical signals conducted from the atria to the rest of the heart. AF can occur in the form of short, temporary (paroxysmal) or be chronic (persistent or permanent) episodes. While once thought to be harmless, it is now known that AF can increase the risk of strokes up to seven-fold. Congestive heart failure, heart attacks, fatigue and mortality risks are also greatly increased in AF patients. These risks can be reduced with effective medical and/or surgical treatment of AF, which returns patients back to normal sinus rhythm. There are two main approaches to surgical treatment of AF: Open-chest surgical ablation: the sternum is firstly divided to allow access to the heart. The heart is connected to a cardiopulmonary bypass machine. Incisions are made in the atria to disrupt the abnormal electrical pathways in order to return the heart rhythm back to normal. This technique is known as “Cut-and-Sew” or Cox-Maze procedure, which can also be performed using alternative energy sources such as radiofrequency, microwave and cryo-energy. The Maze procedure is usually done during other cardiac procedures, commonly mitral valve surgery and coronary artery bypass grafting. 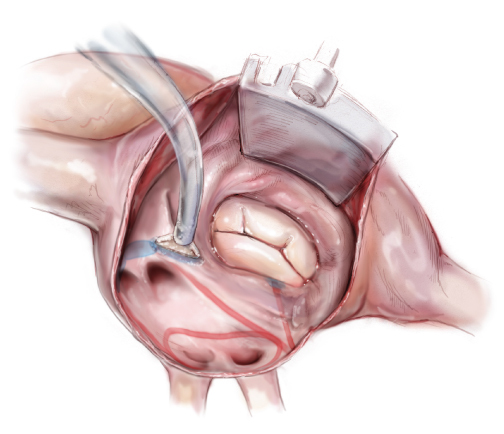 Minimally invasive AF ablation: the main principles of the Maze procedure can be applied minimally invasively without opening the chest from the middle. Small incisions are made between the ribs in the chest wall. A videoscope is inserted through an incision to view the heart. Ablations using energy source(s) are then made to the atria to destroy the tissues responsible for the abnormal electrical circuits. This “Mini-Maze” procedure has the potential benefits of reduced hospital stay, reduced blood loss and improved cosmetic results. The “Mini-Maze” ablation procedure can be performed for selected patients with persistent AF either as a stand-alone operation or concomitant operation while undergoing surgery for other coexisting heart conditions, such as valve or coronary artery disease. Surgical treatment for AF may also be considered for patients in whom medical management or catheter ablation has failed or could not be tolerated. Surgical treatment of AF is associated with long-term freedom from AF and discontinuation of anti-arrhythmic medications such as Amiodarone and blood thinners such as Warfarin. Patients have also reported improved ability to exercise. Potential complications associated with surgical ablation include bleeding, infection, stroke and minor risk of mortality. Some patients may require a permanent pacemaker implantation. The risks of surgery should be weighed against the benefits, facilitated by a detailed discussion between surgeon and patient.